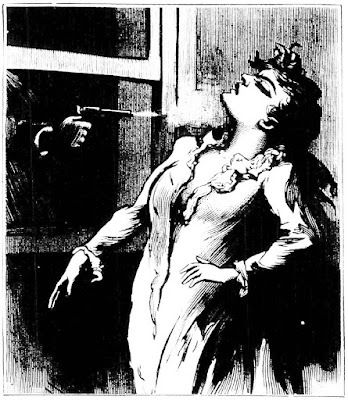 Murder by Gaslight: A Cowardly Lover. Google check shows some leads on the coward murderous scum, James “Jap” Rainey. Seems in 1897, the Kansas senate tried to pass a bill to execute all Death Sentence inmates who were incarcerated under that penalty that had been left lingering...http://genealogytrails.com/kan/cherokee/thedeathpenalty.html Rainey's age at that time is listed as "30". Further research seems to indicate he was paroled in 1913, age approximately 46...https://www.newspapers.com/newspage/109663976/ There is one "James W. Rainey" listed on Find A Grave, buried in Doniphan county,KS...( Approx. 100 miles north of Miami county, KS). Date of birth unknown and date of death, 1930) No way to tell if this is the same man (and if not...no association meant in any manner...merely providing data...). Here is hoping the murderer James "Jap" Rainey met justice in this world in some fashion, as he surely has met it in the next. Sounds right. He was definitely not executed and in 1907 Kansas abolished the death penalty for the next 28 years. I didn't take it any further than that.